The Second Edition of “All About Water – As Told by The Plumber Who’s Seen It All” © by Greg Chick, Illustrated by Audrey Ly and Co-Authored by M.P. Zarrella releases today. 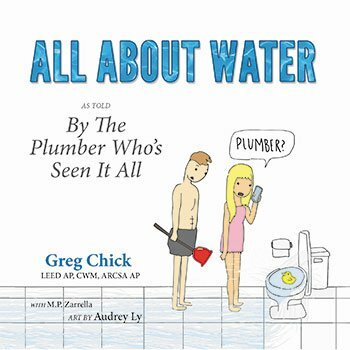 Ramona California’s Greg Chick, a LEED-AP plumber and water advocate with over 40 years experience as a licensed contractor, tells the complete story of water through two fictional characters. There is nothing in the marketplace today like this timely and relevant book.